Title: Official history of the Russian-Japanese war; a vivid panorama of land and naval battles .. 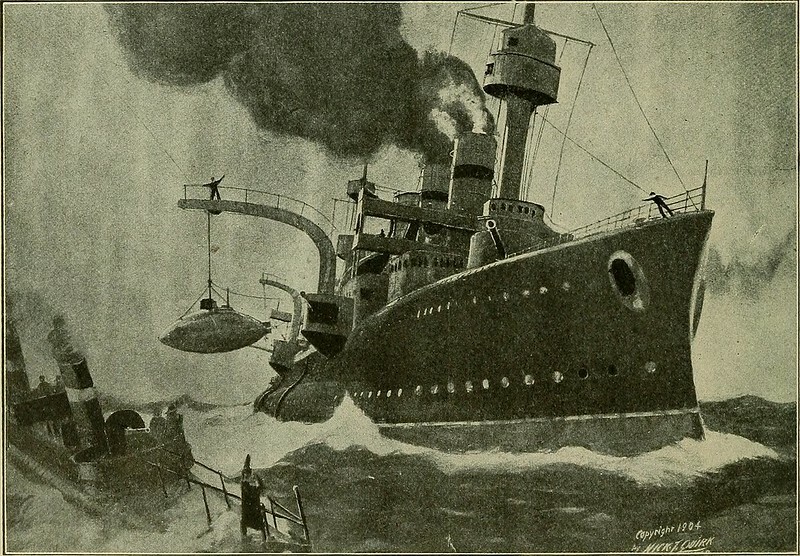 THE SUBMARINE TORPEDO BOAT The lower photograph shows a battleship launching a submarine boat from deckpreparatory to starting it on its errand of death. This boat can be propelled at great speedwhile entirely submerged, and in this manner can approach as near to the ships of the enemyas desired in order to accurately discharge the deadly torpedo. r , ■ The upper picture shows this boat emerging from the depths of the sea after ha-ingattacked the enemy. The terrible destruction worked by one of these boats is graphicallypictured on another page of this book. Image published by Internet Archive Book Images on 2014-07-28 19:50:58 and used under Creative Commons license.